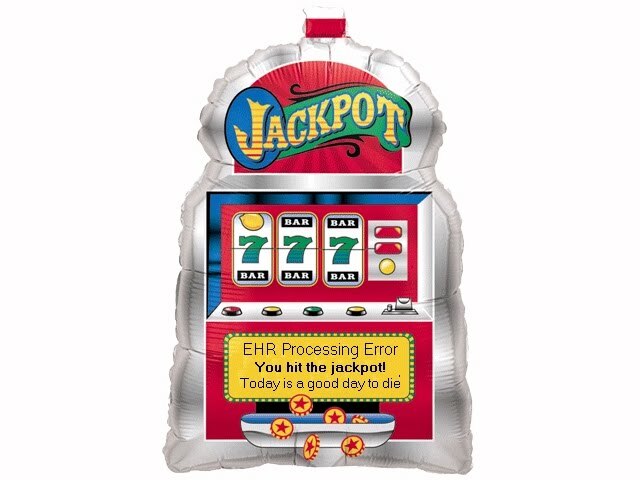 Health Care Renewal: HIMSS Annual Meeting in Las Vegas - Fitting for People Who Gamble With People's Lives to Make a Buck? 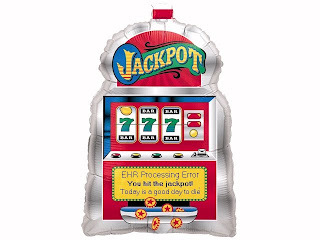 HIMSS Annual Meeting in Las Vegas - Fitting for People Who Gamble With People's Lives to Make a Buck? The setting for the Feb. 2012 annual meeting of HIMSS (the Health Information Management Systems Society, the gargantuan health IT trade group), ongoing as of this writing, is the Venetian Sands Expo Center in Las Vegas, NV. 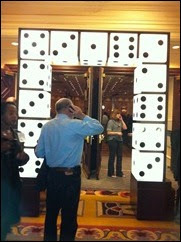 Rolling the dice at HIMSS 2012, Las Vegas. It is difficult to imagine such a statement coming from the aviation, nuclear energy or other lives-at-risk industries. 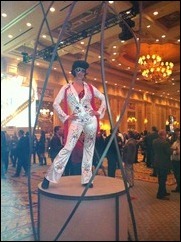 Elvis, a fitting icon for an industry trade show on health IT? Journalist Tony Scherman wrote that by early 1977, "Elvis Presley had become a grotesque caricature of his sleek, energetic former self. Hugely overweight, his mind dulled by the pharmacopoeia he daily ingested, he was barely able to pull himself through his abbreviated concerts." Sounds like what the commercial health IT sector has done to the good intentions and well-thought out applications created by the health IT pioneers. I note that prostitution is legal in Las Vegas as well. This allows making money from objectification of human beings, although at least the latter give consent to the exploitation of their bodies. This is really heartbreaking. It is as if these shysters are partying on the graves of the patients on whom they experiment. Please keep up the fine job you are doing of exposing these things! It is as if these shysters are partying on the graves of the patients on whom they experiment. Especially in face of recent reports by FDA, IOM, NIST, the ECRI Institute and others on HIT's risk, poor usability, etc.. I consider the tone and venue for this extravaganza in extremely bad taste. The tweets coming out of HIMSS12 were particularly out there. These folks are truly full of themselves, concomitantly ignoring the needs of the patients: care, care, care.